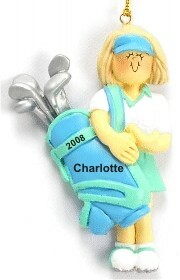 Casual players and fierce competitors alike love the detail in the golf female blonde hair personalized Christmas ornament that is colorful and cute. These hobby ornaments personalized for women include her name and the year painted by hand in a stylish font. She'll enjoy hanging the blonde female golfer personalized Christmas ornament wherever it looks best, so make her day with this attractive decoration that ships in our lovely velvet gift and storage pouch.